I don’t generally give myself enough time to find excuses to not work on something. However, I have noticed that I’m working on a lot of things that are not the one with the deadline that’s about to whoosh by. The deadline is of my own choosing, so it isn’t like I’ll be in too much trouble if and when it whooshes past. I just want to work on something else, something different, something new (read: shiny). The last few days I notice a lot of shiny ideas around me. They are taking over my brain space and making it difficult to concentrate on the editing. I feel like I’m really close to being done. But it isn’t quite there, and that’s difficult to force my head around. 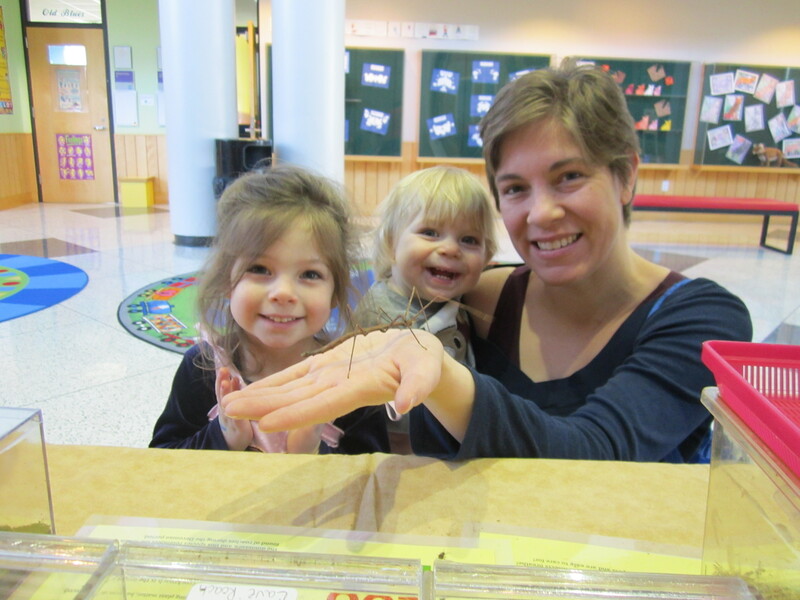 There have also been a lot of distractions from spring break: My daughter doesn’t have preschool, but instead the museum has interesting traveling exhibits like the Insect Zoo and Instrument Petting Zoo. Maybe that doesn’t seem like a big distraction. I remembered my daughter loved bugs, but I didn’t realize that would be over four hours of my week devoted to large creepy-crawly creatures. This is me holding my son and a Vietnamese Walking Stick and my darling daughter standing close, who couldn’t get enough of the bugs. Speaking of bugs, remember I love science fiction and fantasy? Those lovely creatures sparked even more shiny ideas that threaten to keep me from that last bit of editing! The what-ifs are piling in my notebooks, and they need to wait. I have a novel to finish! If you have any great ideas (or even just good ones) for tackling resistance to the project, I’d love to hear them.